Philadelphia is known as the City of Brotherly Love, but it could also be called the City of Motherly Love. 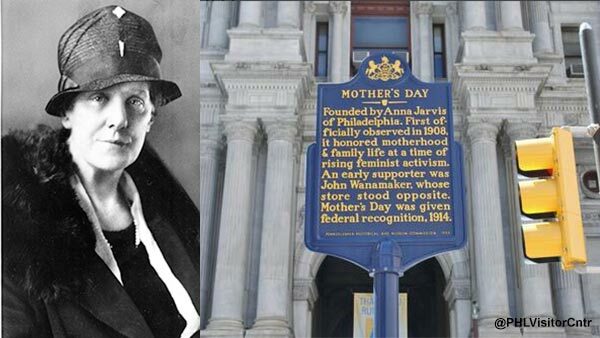 That is because Mother's Day was founded by Philadelphian Anna Jarvis in 1908. "First officially observed in 1908, it honored motherhood & family life at a time of rising feminist activism. An early supporter was John Wanamker, whose store stood opposite. Mother's Day was given federal recognition, 1914." Those words are posted on a historical marker located at the traffic island on Market and Juniper streets, outside City Hall and Macy's Center City - which sits inside the Wanamaker building. Anna Marie Reeves Jarvis inspired the creation of Mother's Day as a national holiday. Jarvis was originally from West Virginia. According to the website ExplorePAHistory, she moved to Philadelphia in 1892. After her mother died, she started her "Mother's Day Movement." "What began as acts of personal remembrance developed into a special church service for her mother back in Grafton, West Virginia, and from there grew into a letter writing campaign under the auspices of a group that Jarvis named the Mother's Day International Association. It was then that Jarvis came into contact with John Wanamaker, the wealthy Philadelphia merchant, supporter of religious causes, and reform politician, who shared her piety and devotion to American mothers, and also saw an opportunity enhance his business," the site says. Jarvis' campaign resulted in a Congressional resolution in 1914, signed by President Woodrow Wilson, proclaiming Mother's Day as a national holiday to be celebrated on the second Sunday in May. The Andrew's Methodist Church in Grafton, West Virginia, where the first Mother's Day service was held, along with Philadelphia, is now the International Mother's Day Shrine. Nearby, the Anna Jarvis Birthplace Museum commemorates the life of the Mother's Day founder. Anna Jarvis is buried beside her mother at West Laurel Hill Cemetery in Bala Cynwyd, Montgomery County.